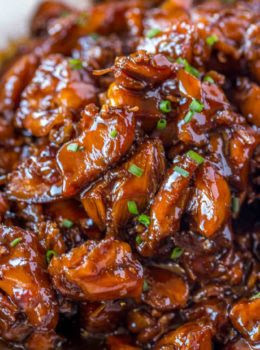 Easy Bourbon Chicken That’s Crispy, Sweet, Sticky And Tastes Just Like The Kind You Grew Up Eating At The Mall! Making this Crispy Bourbon Chicken actually makes me feel like a teenager. A teenager who was a rebel and once actually took Chinese food into the movie theater! Turn the chicken pieces and cook and additional three minutes. Use the remaining oil to cook the second half of the chicken the same way. Add in the garlic and cook for 20 seconds until you can just smell it. Add in the water, apple juice, bourbon, chicken broth, lite soy sauce, ketchup, apple cider vinegar, brown sugar, onion powder, ground ginger and red pepper flakes. Bring to a boil then add back in the chicken. Cook for 10-15 minutes or until the sauce is reduced by about half. Add the remaining tablespoon of cornstarch to a small glass with a tablespoon of water and stir. Add into the pan and stir. Cook until the sauce is thickened. Serve immediately. 0 Response to "EASY BOURBON CHICKEN"